This Wood Folding Chair from Offex is the premier solution for banquets, weddings, graduations, and any other event where easy setup and easy breakdown is a must. This chair sets up quickly and stacks easily to be stored away until your next event. Constructed from choice hardwoods, painted and lacquered, and then topped with a comfortable vinyl upholstered seat, this wood folding chair will last for many events in years to come. 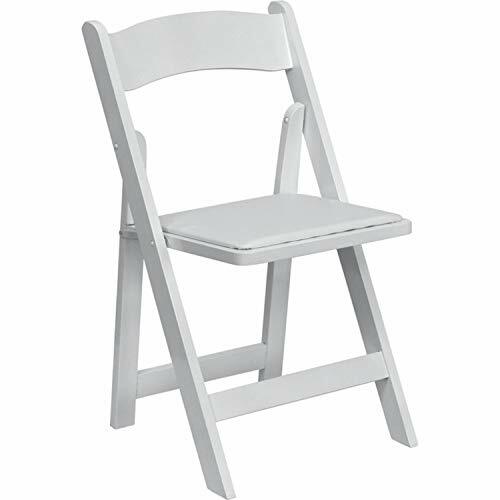 White Wood Folding Chair. Lightweight Design. White Vinyl Padded Upholstered Seat. Waterproof Detachable Seat. White Wood Finish with Clear Lacquer Varnish. Beech Wood Construction. Joints Secured with Nails and Glue. Folds Flat for Easy Storage. Designed for Indoor and Outdoor Use. Overall Dimension: 17.5"W x 17"D x 30.5"H. Shipping Weight: 9 Lbs. Seat Size: 15.5"W X 14.75"D. Back Size: 15.75"W X 14.5"H.
Assembly Required: No. Color: White. Finish: White Wood. Upholstery: White Vinyl. Material: Wood. Made in China.